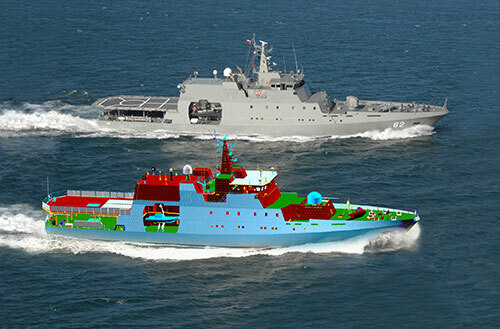 SENER, a world reference in the marine sector, contributes to the shipbuilding industry in two areas: ship design and marine engineering, shipbuilding-oriented CAD/CAM system. All this experience is reflected in FORAN, SENER´s integrated computer-assisted system for the design, production and engineering of ships. FORAN has been deployed in more than 150 shipyards and ship design offices in 30 countries. It represents the leading edge CAD/CAM/CAE technology in shipbuilding, and provides an integrated solution for the entire design of ships. This allows the application of the concurrent engineering concept in a distributed design office environment. SENER´s CAD/CAM system is mainly specialized in ship and offshore platform building. As a really large system, FORAN is further divided into subsystems to deal with different design disciplines, including: FORAN Initial Design, Hull Structure, Machinery & Outfitting, Electrical Design, and Drafting & Mech. CAD. Alma’s Powernest is integrated into the standardized nesting module called FNest, under Hull structure, which has been widely applied in various types of ship building such as small deck boats, vessels and ferries. With Alma’s Powernest, the FNest module is capable of precise gross plate calculation, based on the quantity of various-shaped parts needed to be nested. Thanks to a set of parameters, Alma’s nesting component also allows end-users to make automatic allocation, to launch global nest and to create cutting path instantly. Well-established, and having proved its reliability and unmatched nesting performance, Alma’s Powernest is the first and only automatic nesting solution chosen by SENER. In respect of scrap percentage, Powernest’s nesting results nearly meet the best manual performance that SENER’s ever had, but most importantly with tremendous decrease in response time and improvement in productivity. As a highly intelligent and user-friendly component, Alma’s Powernest allows both global nesting and semi-automatic nesting to cope with different situations. This enables the users to launch fully automatic nesting process, as well as to rearrange the layouts manually by selecting and relocating certain parts, to achieve the best nesting result. To cater to the needs of large global clients, SENER’s software bulk buyers, the old solution of one nesting license attached to a fixed workstation was no longer valid. With Alma’s help, SENER now enjoys a customized and flexible nesting solution based on a floating base. This highly-appreciated solution meets SENER’s specific needs to attain the maximum use of nesting resources. Having worked closely with Alma for about 20 years, SENER is satisfied with the good communication and quality service provided. The development team is always responsive, ready to offer advice and to improve the integration.